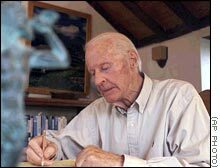 Thor Heyerdahl is a world-renowned explorer and archaeologist. He was born in 1914, in Larvik, Norway. From his earliest days, he was an enthusiatic nature lover, and he was inspired by his mother (who was head of the local museum) to take an interest in zoology and nature. While still in primary school, he ran a one-room zoological museum from his home. Mr. Heyerdahl later enrolled at the University of Oslo, where he specialized in zoology and geography until leaving on his first expedition to Polynesia in 1937-1938. Arriving in Polynesia, the young student Heyerdahl and his bride Liv were adopted by the supreme Polynesian Chief of Tahiti, Teriieroo in 1937. After training in the Polynesian way of life and customs, the Heyerdahls settled for one year on the isolated island of Fatuhiva in the Marquesas Group. While doing research on the transoceanic origins of the island's animal life, the naturalist lived an otherwise traditional Polynesian life. During this time, he began to contemplate the existing theories of how the South Pacific inhabitants reached the islands. Stuggling with the eternal easterly winds and currents whenever he and his Polynesian friends ventured into the sea to fish, he lost faith in textbook claims that these islands had been discovered and settled by as yet unidentified stone-age voyagers from Southeast Asia who had sailed and paddled against the currents for ten thousand miles. Instead Heyerdahl became convinced that human settlers had come with the ocean currents from the west just as the flora and fauna had done. Abandoning his study of zoology, Heyerdahl began an intensive study of testing his theory on the origins of the Polynesian race and culture. He suggested that migration to Polynesia had followed the natural North Pacific conveyor, therefore turning his search for origins to the coasts of British Columbia and Peru. While working at the Museum of British Columbia, Heyerdahl first published his theory (International Science, New York, 1941) that Polynesia had been reached by two successive waves of immigrants. His theory suggested that the first wave had reached Polynesia via Peru and Easter Island on balsa rafts. Centuries later, a second ethnic group reached Hawaii in large double-canoes from British Columbia. The results of Heyerdahl's research were later published in his 800-page volume, American Indians in the Pacific (Stockholm, London, Chicago, 1952). 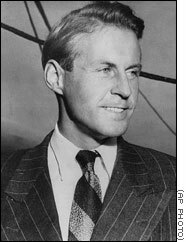 Interupted by the outbreak of the Second World War, Heyerdahl returned to Norway to volunteer for the Free Norwegian Forces, eventually serving in a Nowegian parachute unit in Finnmark. After the war, Heyerdahl continued his research, only to meet a wall of resistance to his theories amongst comtemporary scholars. To add weight to his arguments, Heyerdahl decided to build a replica of the aboriginal balsa raft (named the "Kon-Tiki") to test his theories. In 1947, Heyerdahl and five companions left Callio, Peru and crossed 8000 km (4300 miles) in 101 days to reach Polynesia (Raroia atoll, Tuamotu Archipelago). Despite skepticisim, the seaworthiness of the aboriginal raft was thus proven and showed that the ancient Peruvians could have reached Polynesia in this manner. 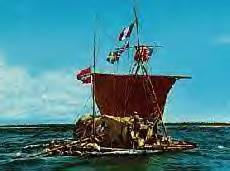 Following the success of the Kon-Tiki Expedition, Heyerdahl organized and led the Norwegian Archaeological Expedition to the Galapagos Islands. 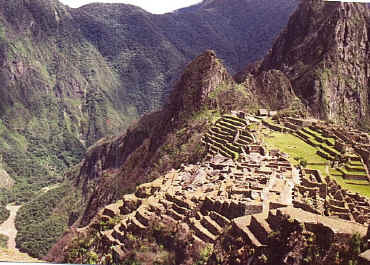 The group investigated the pre-Columbian habitation sites, locating an Inca flute and shards from more than 130 pieces of ceramics which were later identified as pre-Incan. The Galapagos Islands are located about 1000 km off the coast of Ecuador and thus South American archaeology was extended for the first time in to the open Pacific Ocean. Parallel to this expedition, Heyerdahl worked with experts in rediscovering the lost art of the guara, a kind of aboriginal center-board used by the indians of Peru and Ecuador for navigation. From this tool, not used on the Kon-Tiki voyage, it become clear that ancient South American voyagers had the means to navigate as well as travel great distances in the Pacific. Following his successful work, Heyerdahl was encouraged to direct a major archaeological expedition to the Pacific's most isolated island: Easter Island. An expedition of 23 persons reached the island and began the first sub-surface archaeological excavation every attempted. They soon discovered that Easter Island had once been wooded until deforested by its original inhabitants, who also planted water-reeds and other South American plants. Carbon dating showed that the Island had been occupied from about 380 A.D., about one thousand years earlier than scientists previously believed. Excavations indicated that some ancient stone carvings on the Island were similar to ancient traditions in Peru. 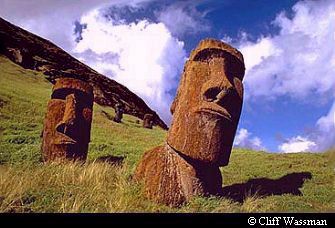 Some Easter Islanders claimed that according to their legends, they orginally arrived from the far away lands to the East. The results of Heyerdahl's work were widely discussed and presented at the Tenth Pacific Science Congress in Honolulu (1961) where they were supported by the unanimous statement: "Southeast Asia and the islands adjacent constitute one major source area of the peoples and cultures of the Pacific Islands and South America". Thus, Heyerdahl's eastern migration theory had gained considerable influence. 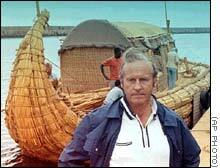 Thor Heyerdahl continued his research on ancienct navigation and turned his attention to the ancient reed-boats made of papyrus. These boats were deemed insufficient to cross the Atlantic as the reeds were believed to become water-logged after less than two weeks on open water. Heyerdahl believed that contemporary science underestimated the the ancient vessels and undertook to prove this by experiment. In 1969, he bought 12 tons of papyrus and worked with experts to construct an ancient-style vessel. The result was a 15 m boat which was launched at the old Phoenician port of Safi, Morocco. 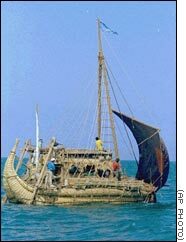 In the spirit of cooperation, Heyerdahl embarked under the UN flag with a crew of seven men from seven countries. The papyrus craft, Ra, sailed 5000 km (2700 nautical miles) in 56 days until storms and deficiencies in the construction caused the team to abandon their target only one week short of Barbados. Ten months later, Heyerdahl tried the same voyage with the smaller (12 meter) Ra II. This vessel crossed the widest part of the Atlantic 6100 km (3270 nautical miles) in 57 days, from Safi to Barbados. Once again, this voyage showed that modern science under-estimated long-forgotten aboriginal technologies. The theory that Mediterranean vessels built prior to Columbus could not have crossed the Atlantic was thrown on its head. In subsequent years, Heyerdahl continued on many other expeditions, including the Tigris river (1977) and the Maldives Islands (1982, 83 and 84). Now in his eighties, Heyerdahl remains an active participant in archaeological expeditions, as well as an international promoter of cooperation and understanding between peoples across the globe. 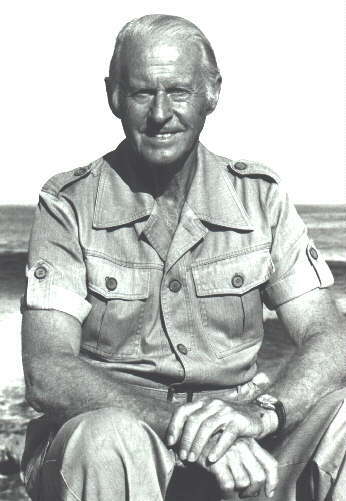 Thor Heyerdahl is the recipient of numerous medals, awards and honours. He has been a regular member of various scientific congresses, notably the International Congress of Americanists, the Pacific Science Congress, and the International Congress of Anthropology and Ethnology. Note: (Heyerdahl's English language publishers are Allen Unwin Ltd., London, Rand Mc Nally Company, Chicago, and Doubleday Co. Inc., New York). 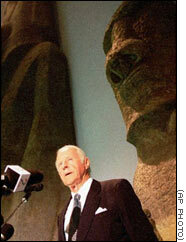 Thor Heyerdahl was honored five years before his death to the day -- April 18, 1997 -- at the Kon-Tiki Museum in Oslo, Norway, where he was pictured near a stone statue from Easter Island. GUIMAR, Canary Islands (AP) -- It has been a half-century since Thor Heyerdahl and five other Scandinavians made history by sailing the Kon-Tiki raft across the Pacific, nearly drowning at the end of the 101-day voyage when they smashed into a coral reef of an uninhabited Polynesian atoll. The first ham radio operator to pick up their distress call didn't believe them, so they sent another: "All well. All well. All well." To which another ham answered, "If all's well, why worry?" As Heyerdahl -- who died Thursday (read the obituary) -- would later describe it, it was a somewhat comical finale to a 5,000-mile odyssey in pursuit of an answer to one of Earth's abiding mysteries: How did humankind spread from one continent to the next? "The Kon-Tiki expedition opened my eyes to what the ocean really is. It is a conveyor and not an isolator. The ocean has been man's highway from the days he built the first buoyant ships, long before he tamed the horse, invented wheels and cut roads through the virgin jungles," he wrote in the foreword to the 35th edition of "Kon-Tiki, Across the Pacific by Raft," the best seller that catapulted him and the balsa log raft to international fame. A half-century after Thor Heyerdahl sailed almost 5,000 miles on the Kon-Tiki his theories of intercontinental human migration are still being debated -- frequently by admiring colleagues. Heyerdahl, a Norwegian who moved to the Spanish island of Tenerife off the west coast of Africa in 1990, has spent his life gathering evidence -- from astronomically oriented pyramids to ancient art depicting reed boats -- that seafaring sun-worshippers crossed the oceans in prehistoric times. Seeking to prove his theories, Heyerdahl made other voyages after Kon-Tiki, sailing reed boats woven by Peru's Aymara Indians from North Africa to the Caribbean and from Iraq to the Red Sea. His rafting travels continued into the late 1970s. It was 1947 when Kon-Tiki left Callao, Peru, acting on Heyerdahl's radical idea that ancient Peruvians could have made the same trip 1,400 years earlier and settled Polynesia. He also argues that 600 years later, Southeast Asian-descended people who reached Hawaii via western Canada then spread over Polynesia. The prevailing theory among other scientists is that Polynesia was populated directly from Southeast Asia. The idea for the Kon-Tiki was ridiculed by mainstream scientists who said the logs would become waterlogged and sink. But to a public emerging from the wreckage of World War II and eager for peacetime heroes, the voyage was something of the moon landing of its time. This photo was taken in 1947, the year in which Heyerdahl sailed the Pacific aboard Kon-Tiki. The crew braved raging storms and ocean calms, with a shortwave radio their only contact with the outside world. They often breakfasted on flying fish that landed on deck. Whales played games with the raft, and circling sharks were constant companions. The voyage ended when wind and currents forced them aground on uninhabited Raroia atoll in the Tuamoto Archipelago. Heyerdahl's book, published in 67 languages, has become a classic. A black-and-white documentary film of the journey won an Oscar in 1951. Kon-Tiki, named after a pre-Inca sun god, became a household word. Heyerdahl was dubbed "Senor Kon-Tiki" and "The Kon-Tiki Man" in two biographies. He is a national hero in his native Norway, and his raft sits in Oslo's Kon-Tiki Museum. Until very near his death, Heyerdahl continued to pursue and defend his theories. It has taken some 50 years for the scientific establishment to appreciate his early work and grasp the full significance of the idea behind the Kon-Tiki voyage. Admiration now comes even from some who say his theories are not proven. "Very few people have the courage or energy to cross the boundaries between disciplines. I think Heyerdahl is one of these people, and should be admired for it," said Erika Hagelberg, a geneticist at the University of Oslo who has studied the DNA of American Indians and Polynesians. 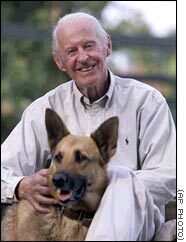 Heyerdahl was pictured here with his dog Reina on the Canary Island of Tenerife in February. He first arrived on the island to excavate step pyramids there. On February 25, weeks before he fell seriously ill, Heyerdahl sat down for an interview at a picnic table beside an ancient South American tree on his secluded estate in the Canary Islands, Spanish territory off Africa. Slim, with white hair, he looked fit and alert as he expounded his much-debated view that the earliest known civilizations in Mesopotamia, Egypt, China and the Mediterranean sailed in reed ships, as depicted in their ancient art. "That's how civilization grew. By sea, you got contact, new raw materials and inspiration," he said. "I believe that these first navigating people were sun worshippers and that their form of temple was a step pyramid, sometimes built over the tombs of some important royalty and always astronomically oriented with ceremonial stairways or ramps to the summit where ceremonies were performed to the rising sun," he said. He added that "these navigators ... also made links, with Mexico and Peru possible, and from Peru again all the way (across the Pacific) to Western Samoa." He scoffed at the idea that Leif Ericsson or Christopher Columbus could have been the first to sail to America. "We Europeans are so one-track-minded when it comes to our own history that we say to the world that Europe discovered the whole world," he says. "I say that no European has discovered anything but Europe." The academic world reacted to the Kon-Tiki trip by accusing him of ignoring established knowledge that Polynesia was first settled by Asians. "You will find that (accusation) repeated 10,000 times," he said. "That is a sheer lie and I can prove it." Heyerdahl said his critics read his book "Kon-Tiki" -- part science, part adventure story -- but ignored his academic manuscript, "American Indians in the Pacific: The Theory Behind the Kon-Tiki Expedition," which he couldn't get published until 1952. The 800-page book uses genetic evidence such as blood types and cultivated plants to posit that settlers from Peru arrived in Polynesia before the Asian-descended people. The Kon-Tiki voyage upset scientists by undermining their pet theories, Heyerdahl said. "When I sailed Kon-Tiki, that started the bombardment. I shouldn't have proven my theory correct." Heyerdahl was pictured with his reed vessel, the Ra II, in the Port of Safi, Morocco before leaving on a second attempt at an Atlantic crossing. Heyerdahl remained involved in the study of step pyramids, which -- along with reed boats and prevailing winds and currents -- support his theories about the spread of civilization by ancient seafarers. In the 1980s, he directed excavation of South America's largest pyramid complex, Tucume in Peru, where researchers found reliefs of bird-headed men navigating reed ships, evidence that men sailed along the Pacific coast before the Spanish conquest. He first came to Tenerife to excavate six pyramids thought to be only piles of rocks built by early Spanish farmers. But Heyerdahl recognized them as step pyramids, and now 120,000 visitors a year come to see the Chacona Pyramid Ethnological Park. Heyerdahl recently was excavating a structure in West Samoa that he believes could be "the western extremity" of step pyramids built by sun worshippers. Step pyramids are found mainly in Egypt, Mesopotamia, Mexico and Peru. Heyerdahl says there is evidence they existed around the Mediterranean -- including some along the North Africa coast that were destroyed and rebuilt into Greek temples. 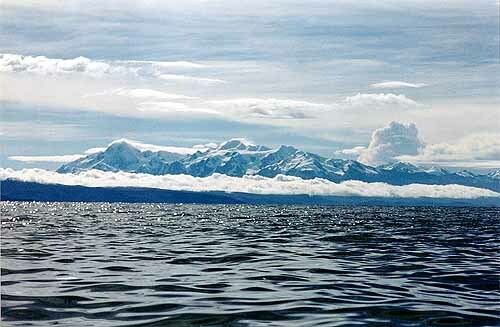 The largest is Peru's Akapana near Lake Titicaca, where the Aymara still weave reed boats. "I don't know if it's me following the step pyramids or it's the step pyramids following me. There has been a chain of them my whole life," Heyerdahl said. "Usually you consider yourself fortunate to find some potsherds when you look for archaeology, but it is rather unusual to stumble over step pyramids, and still, this has happened to me in three world oceans." OSLO, Norway (AP) -- Thor Heyerdahl, the Norwegian explorer who crossed the Pacific on a balsa-log raft and detailed his harrowing 101-day voyage in the book "Kon-Tiki," died Thursday night. He was 87. Heyerdahl stopped taking food, water or medication in early April after being diagnosed with a terminal brain tumor. Relatives said he died in his sleep at a hospital near his family retreat at Colla Michari, Italy. Experts scoffed at Heyerdahl when he set off to cross the Pacific aboard a balsa raft in 1947, saying it would get water logged and sink within days. After 101 days and 4,900 miles, he proved them wrong by reaching Polynesia from Peru, in a bid to prove his theories of human migration. His later expeditions included voyages aboard reed rafts, Ra, Ra II and Tigris. His wide-ranging archaeological studies were often controversial and challenged accepted views. Heyerdahl maintained a high pace of research, lectures and travel until his sudden illness. He moved to Tenerife in 1990 but kept Colla Michari as a retreat. Throughout his life, Heyerdahl continued to challenge accepted scientific beliefs, with expeditions aboard the reed boats Ra, Ra II and Tigris, as well as archaeological studies around the world. Despite his advanced years, he remained an active researcher and lecturer until his illness. His wife Jacqueline said he boarded 70 airline flights in 2001. Heyerdahl was born Oct. 6, 1914, in the southern Norway town of Larvik. He was the son of a widely traveled banker and a mother with a scientific bent, who he remembered gave him anthropology books instead of children's books to read when he was sick in bed. The school in his hometown was renamed the Thor Heyerdahl Secondary School in 1995. Heyerdahl was rushed to Santa Conora hospital on the Italian Riviera nearly three weeks ago after becoming ill during a family gathering at Colla Michari. At his request, he was released from the hospital and brought back to Colla Michari to spend his final days surrounded by family. "He wanted to go there -- to use his words -- because it was time to hang up his oars and ride into the sunset," his oldest son said earlier. Thor Heyerdahl Jr. said his father had expressed happiness and satisfaction with his life before slipping into unconsciousness on Tuesday. Heyerdahl was a frequent visitor to Norway, where the Kon-Tiki museum in Oslo maintained an apartment for his use. He became a national hero in this maritime nation of 4.5 million people that voted him Norwegian of the Century in a 1999 newspaper poll. His later studies focused on ancient step pyramids -- including those in Peru and on the island of Tenerife off Africa -- which he believed could show maritime links between ancient civilizations. He had nearly drowned twice as a child in Larvik, Norway, and overcame his fear only at age 22, when he fell into a raging river in Tahiti and swam to safety. "If you had asked me as a 17-year-old whether I would go to sea on a raft, I would have absolutely denied the possibility. 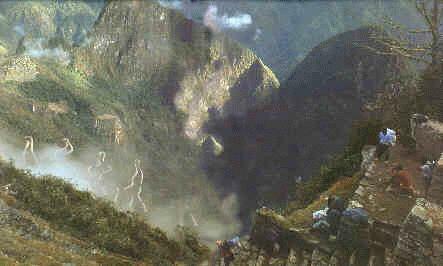 At that time, I suffered from fear of the water," Heyerdahl once said. (AP) -- While Thor Heyerdahl's theories on ancient seafarers spreading civilization were initially ridiculed by scientists, a younger generation is studying his ideas from five decades ago as the basis for new ideas about early cultural exchanges. Robson Bonnichsen, who studies how the American continent became populated, calls Heyerdahl "a visionary ahead of his time." Bonnichsen, director of the Center for the Study of the First Americans at Oregon State University, told The Associated Press that many experts now give serious consideration to the idea that people in boats sailed along the Pacific Rim. "Our perception of the peopling of the Americas is changing" and encompasses more than one colonization, including an early population from Southeast Asia, he said. "A lot of new ideas are on the table -- and Thor Heyerdahl led the way years ago," he said. The new theories suggest that American settlement was much more complex than first thought and that migrants arrived more than once and from different parts of the world. Dennis Stanford, an anthropologist at the Smithsonian Institution's National Museum of Natural History in Washington, has even suggested some American ancestors could have come from Spain during the Ice Age, arriving in Maine after skirting the ice of the North Atlantic in boats. Walter Neves of the University of Sao Paulo is gathering evidence suggesting that early South Americans originated in Australia or South Asia and possibly crossed the Pacific. Erika Hagelberg, a geneticist at the University of Oslo, says the study of DNA in the Pacific has not proven Heyerdahl's theories right or wrong. "There is definitely a genetic connection between Polynesians and Native Americans, but it probably traces back to a common origin in Asia," she said. Hagelberg, who has received some Kon-Tiki Museum grant support, says there is no genetic data that indicates a strong South America influence in Polynesia, but "that does not rule out a connection, as there are many reasons why South American genes might not be detected in Polynesia today." She noted that it will probably take scholars from various sciences to thoroughly examine Heyerdahl's work and lauded him for the way he crossed the boundaries between scientific disciplines. In his 1997 memoir, "In the Footsteps of Adam," he frequently makes the point that academic specialists often fail to see the forest for the trees. "The more I do and the more I see, the more I realize the shocking extent of ignorance that exists among the scholarly circles that call themselves authorities and pretend to have a monopoly of all knowledge," he wrote.